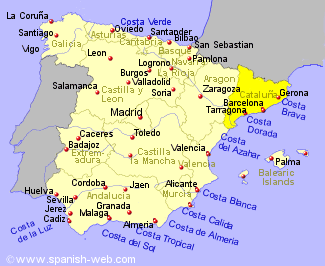 Catalunya embraces the Pyrenees and the Costa Brava. A seafaring nation providing some of the Mediterranean's best fish stews, Zarzuela and Suquet, a combination of fish and shellfish. It is also famous for five sauces which form the basis of many Catalan dishes, Sofrito, a tomato sauce flavoured with onions and garlic; Samfaina, with aubergines, peppers and courgette; Picada, toasted almonds and hazelnuts ground to a paste with garlic and parsley; Alioli made with garlic, and Romesco, a sweet pepper sauce. Butifarra, a fresh white sausage is regularly eaten with beans and in stews. All meals come with tomato-coated bread Pa amb Tomaquet. Catalans also serve a simmered meat pot called Escudella. Pasta is popular too especially cannelonis and thin Fideos with seafood. Roast chicken, duck and game from the mountains, are frequently eaten, with lamb being grilled on an open fire along with vegetables. Creamy desserts are popular which include curds with honey, Mel I Mato, and crema Catalana, the local Creme Brulee. Small nut cakes are served at festival time called Panellets.